This is yet another of my "Cached Website Rescue Missions". but I have resurrected the codes and content so you can continue to read these fine reviews. UPDATE: I have since located the new versions of the Hackett Reviews. Since I have already gone to all the trouble, I shall leave my versions up. This album has always been one of my favorites, but I just recently acquired a legitimate CD copy (for years I relied on a copy made by my older brother Todd - the flip side of Selling England By The Pound!). I finally plunked down some cash for the disc when I ordered Hackett's Tokyo Tapes and it was well worth it. What I enjoy so much about this album is the variety of the different tracks. After Hackett's solo debut, the prog tour-de-force Voyage of the Acolyte, it's obvious that he was intent on trying some different things. Having said that, the proggier stuff on here is top notch. "Racing in A" is a great tune, filled with dual guitar lines, Mellotron sweeps, and capped off by a fantastic classical guitar bit. The title track, with the interplay between Hackett's guitar and his brother's flute is equally impressive. More important, Hackett's attempts at different kinds of tracks work equally well. "How Can I" is a nice quasi-folk tune (with Richie Havens on vocals no less), "Kim" is a brief acoustic guitar/flute instrumental, and "Hoping Love Will Last" is a knockout bluesy ballad. While I generally don't approve of prog masters trying to go a little more straightforward (and it doesn't always work for Hackett, either), nothing here is anything but well done, at least. Please Don't Touch was an important step for Hackett, a step away from his roots with Genesis. While his output since this album has been spotty, he has always been trying something different, from a full blues album to classical guitar with a full orchestra. And for that I salute him. That everything didn't come out as well as this disc is nothing to be ashamed of. Steve Hackett's second solo album (and first after leaving Genesis) takes a rather strange turn away from his trademark Genesis style or introspective acoustic work into more conventional waters. Songs are shorter and the vocal density is increased compared to Voyage of the Acolyte. Steve Walsh lends vocals to two tracks here, and the result is not too surprisingly like Kansas' poppier work. The second of these, "Racing in A", takes a couple of turns into a solo Hackett performance on acoustic guitar which is quite nice, but overall these intervals are relatively rare over the course of the album. The instrumental "Kim" features only a flute playing a simple, pastoral melody over Hackett's guitar, and is another strong moment. For the most part, though, this is a more mainstream, and thus less interesting, slice of Hackett's oeuvre. Hackett himself seems to have retreated from this direction after this album, which is perhaps an indication that he was less than satisfied with the results. 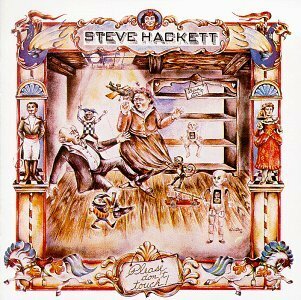 This might be considered Steve Hackett's first 'real' solo album in a sense, if one considers his actual debut, Voyage of the Acolyte, to be more along the lines of an honorary Genesis album. With Please Don't Touch, Hackett was extending towards a broader array of musical styles and musicians. How many albums have members of Kansas and Richie Havens on it? This is a much more down-to-earth affair, and the lofty lyrics and abstruse Tarot card imagery of Acolyte are jettisoned for more accessible, interpersonal themes (e.g. "How Can I? ", "Hoping Love Will Last") and playfully dark humor (e.g. the Agatha Christie-inspired "Carry On Up the Vicarage"), a recurring theme for the early Hackett albums. The vocalists all lend credible performances to the material they are given. Kansas lead vocalist Steve Walsh handles the songs that call for an extroverted lead, in this case the upbeat "Narnia" and the more rock-oriented "Racing In A." Havens, with his folk background, handles the more introverted tunes. One of them, "How Can I?" recalls the tail end of Hackett's tenure with Genesis (e.g. "Inside and Out," "Your Own Special Way"), and here Havens even sounds a bit reminiscent of Peter Gabriel. Randy Crawford, discovered by Hackett in a Chicago club, gives a silky, soulful performance for the ballad "Hoping Love Will Last," which I bet would have made a strong late 70s F.M. single, had it been released as such and gained exposure on the radio. Hackett takes all these various elements and blends them more or less against a prog landscape, and pretty successfully, too. Please Don't Touch is different from the more straightforwardly prog albums that surround it in the solo Hackett canon, and it must have been somewhat surprising for the fans who purchased it back in the day. Nevertheless, it makes an effective musical journal of Hackett's development through this time. Another excellent Hackett masterpiece. The music on this CD is diverse and yet may be the most accessible of his early recordings. There are guest vocalists on many tracks, which is a plus. The songs are shorter than usual but pack everything from folk ballads to classical guitar. "Narnia" features Kansas vocalist Steve Walsh, and is based on C.S. Lewis' books. This is a great tune, very upbeat, with an excellent performance by Walsh; it's catchy enough to have been a radio tune. "Carry On Up the Vicarage" opens with a toy piano and sound effects with Christmas songs being sung; the music is very eclectic, with the vocal having a childlike effect in one ear and a deep vocal in the other. "Racing in A" again features Walsh with another excellent performance that is heavy rock with some nice mellotron work, again upbeat, a lot of stop and start at the end. "Kim" is a classical guitar piece with flute. "How Can I" features the unlikely pairing of Hackett and Ritchie Havens; it's an acoustic guitar piece with Havens on vocals. I really like Havens' singing here. "Hoping Love Will Last" is a piano vocal piece, a ballad, and has kind of a R&B feel. Very different from anything he has done before or since for that matter, but a very pretty song, that ends up very well-orchestrated. "Land of a Thousand Autumns" and "Please Don't Touch" share the same theme for the most part, the first being atmospheric, and the latter is an in your face instrumental with very powerful guitar, bass pedals, keyboards and sound effects. "The Voice of Necam" again uses the theme of the prior, played on a creepy sounding organ again with sound effects, music expands with voice effects and acoustic guitar. "Icarus Ascending" features Havens on vocals, very dramatic and dark at times, lush instrumentally, end is very eclectic with short sections of reggae, jazz, and lots of guitar effects. Of the early Hackett recordings, this one I listen to the least. But this should not take away from the record at all, as it rates up there with his best. Please Don't Touch is a very nice fan site. Genesis- Official is the obvious link, and the official website to boot. Here's an unfinished but promising fan page. Still another Genesis fan page. There You Have it. Pretty much worth the effort, I'd say. Full credit for the content of this review shall go to the staff at Ground and Sky.